One of the significant challenges in office design is to create the right balance between aesthetics and the need for a highly practical and functional workspace. In every office, there’s a prerequisite to create different zones – desk areas, breakout zones, formal meeting rooms, public reception spaces - and the traditional way to do this has been through the use of walls and partitions to divide up and compartmentalise different areas. 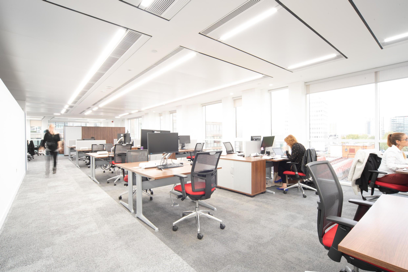 However, recent developments by flooring manufacturers have now opened up new opportunities - to create spaces without walls, by using carpet and flooring colours, finishes and textures that seamlessly transition between the different areas of an office. It’s new, it’s exciting, and it may be the perfect solution to make the best use of your office space. Traditionally, flooring manufacturers viewed carpet and vinyl as apples and pears; two different surfaces, with two different uses, always separated by an abrupt trim. Recently manufacturers have wised up - why not create the option of having both carpet and vinyl surfaces in a standard 500 x 500mm tile. Sounds pretty simple, but for office designers, it’s quite revolutionary, and opens up the opportunity to design spaces without the need for partitioned walls, in a way that wasn’t possible before. And here’s the even better news - because all flooring surfaces can now coalesce around a standardised tile, your designer can create innovative combinations of colour, finish and texture at standard prices. In other words, you can get an imaginative and practical floor design, without additional costs to your flooring budget. The design concept of creating spaces without walls is to combine different flooring finishes and textures that transition seamlessly from one office area to the next. Workstation areas can be separately zoned, with walkways and thoroughfares demarcated. For the transition to more formal meeting areas, colour and texture can be used to create a different feel for the zone and, within meeting rooms, different colour tiles can be combined to create a distinct feeling from the rest of the office. When partitioning is being used for more private areas, these zones can be accentuated by floor colour. For hallways and office walls, a colour mixture can be used to make them feel more extensive and luxurious. If you would like to find out more about how creating spaces without walls could work in your office, please contact the Cityspace team on info@cityspacemanagement.co.uk. Thank you! Someone in our team will be in touch with you soon! © Cityspace Management Limited 2019. All rights reserved. Company number 4692672. We offer our services under the CITYSPACE brand name.